Learning to dance involves mirrors. Lots of mirrors. You need to know what the right look feels like. Thankfully, there are no mirrors in my living room as, clad in ill-fitting athletic attire, I attempt to do the Hustle. Harmonix’s Dance Central 3 feels like the expected evolution of the series: more songs, more features, streamlined interactions. The core of the game is the same as the previous two: a series of dance moves scroll up the side of the screen and you need to perform them in time with the music and the on-screen dancers who are doing mirror-image versions of the dance moves. Their moves are always perfect, always on the beat. A mistake doesn’t send one of their arms or legs flailing off in another direction. There’s no giant GAME OVER screen, no life lost. Whatever you’ve got in the wrong place is outlined in red on the onscreen dancer’s body. Positive feedback (flashes of “flawless!” and “Great!”) is just as vague as the negative feedback (“Almost!”). The red outlines never tell you how you’re not matching the moves, just that you aren’t. It gives me a weird feeling: even when that red outline is missing, I know my moves don’t look that good. I can feel the rhythm and I can feel the lack of gracefulness in my moves, but part of my brain is registering what the dancers are doing, what I’m trying to do, what I’m imagining I am doing, as what I’m doing. There is a dissonance between what my body feels I am doing and what the game is showing me, and what it’s telling me I’m doing well. I go to a lot of shows, I see a lot of people dancing or bobbing their heads or tapping their feet to a rhythm completely different from the music. What does that feel like? Is it abandon, being so into the moment that you don’t know you’re off the beat? But I’m racking up points, earning three or four stars on songs on medium difficulty, so I must be doing something right. 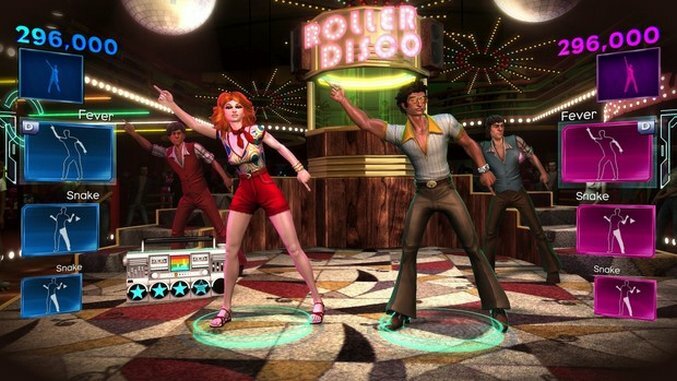 The game has a story mode, but rather than what one might expect from Harmonix’s previous efforts (like the Rock Band games), it’s not the tale of a young dancer with heart making their way from basement shows to some world-famous dance party. You, and not an avatar you choose, are recruited by the Dance Central Intelligence Agency. You’re sent through time to meet up with Dance Central Intelligence Agents in the 1970s, 1980s, 1990s and 2000s to learn power moves for a decade-specific dance craze which the DCIA will use to fight Dr. Tan, the kind-of-Asian-menacey opponent who is trying to steal grooves or something. It provides a structure for the game where to progress to the next decade you have to dance well enough to earn enough stars to power your time travel boombox and learn that decade’s dance craze. The key moves for each dance craze are part of the dances of that decade: when one comes up in a song, you have to nail the move perfectly in order to “learn” it. Once you’ve got them all you can learn the decade’s craze. For the 1970s, it’s the Hustle. My living room is not very large, and even with a wide-angle attachment the Kinect has a bit of trouble picking up all of my movement. It takes a few tries in “I Will Survive” before it fully registers that my Walk-Back-And-Clap and Walk-Forward-And-Flap are acceptable enough. This is where that lack of specific feedback from the on-screen display falls short: I can’t tell if it’s the camera that’s missing something, if I’m not quite stepping properly, or what is going wrong. It doesn’t matter as much for the other moves because the game is not asking you to nail them specifically. And it doesn’t matter at all for the game’s new Keep the Beat mode, where players make up their own dances and the game determines (through some kind of rhythmic computational magic) whether or not the player is on the beat. Another mode has players creating dance moves and then challenging each other to repeat them. And here, like with the super moves, it’s not that you have to learn them so much as you have to learn how to communicate to the Kinect that you have learned the moves. And so unclear feedback can be a hassle—though it could also work in your favor. I’m sure I’m not a very good dancer, and it’s difficult to tell how much the game is fudging my moves. Even though I’m dancing alone in my apartment with no mirrors, I’m still on display. The Kinect is looking at me, judging me in an inscrutable way, running its calculations and deciding whether or not I am good enough. And am I learning to dance? Does it even matter? Dance Central 3 was developed by Harmonix Music Systems and published by Microsoft. It is available for the Xbox 360 Kinect.